The observance of June Dairy Month began in 1937 as a way to promote drinking milk. It’s expanded to celebrate all dairy products and their contributions to the world, and consumers continue to indulge. While the benefits of traditional dairy products are well documented, they do have some shortcomings for food manufacturers. Most dairy alternatives that address the obstacles posed, however, simply don’t measure up in regards to flavor, texture or nutrition. There is an all-natural, all-dairy product that overcomes the challenges of using premium dairy, such as milk, cream, butter and cheese, while maintaining its favorable characteristics. Let’s take a look at the three main drawbacks of using conventional dairy ingredients and how to overcome them with functional whey protein ingredients. The dairy industry has seen extreme fluctuations in pricing in recent years. Analysts are divided on whether markets will rise or fall moving forward, which leaves food manufacturers who use traditional dairy products in their formulations in a precarious position. Forecasting ingredient costs and maintaining consistent cash flow is the foundation of sustaining a profitable margin. When dairy prices unexpectedly soar — as was recently the case with global butter markets — profits fall. Products such as Grande Bravo® functional whey protein serve as an affordable and price-stable dairy ingredient that can reduce or completely replace butter, cheese, milk and cream in many applications without compromising taste or texture, eliminating the erratic ingredient costs of premium dairy. A challenge plaguing many food manufacturers that use fresh dairy ingredients is refrigeration and storage requirements. Health regulations by the U.S. Food & Drug Administration (FDA) also dictate special handling and insist on strict compliance. Meeting all these fresh dairy requirements is expensive due to equipment needs, energy usage, extra labor, permits and other associated costs. Most companies account for a percentage of their ingredients to go to waste due to spoilage, a decrease in demand and other factors, but it doesn’t have to be that way. Unlike perishable dairy products, functional whey protein has a much longer shelf life and doesn’t require refrigeration. Its compact packaging allows for easy storage to minimize inventory space and no special permits are required. Consumers are looking for wholesome, natural ingredients and clean labels on food products. For this reason, butter, cream, cheese and other dairy products have seen a resurgence after having fallen out of favor for many years. But consumers still have a hard time overcoming concerns about the high fat and calorie content found in traditional dairy. Reducing or replacing premium dairy with Grande Bravo® functional whey protein can improve nutrition by lowering fat content and calories. When replacing cream cheese in a spread, for example, it results in 28% less fat while maintaining and even improving the creamy textures found in many applications. During June dairy month, we’d like to spotlight the contributions that dairy products — all dairy products — have on our economy and on the health of our nation. Whey protein is a natural dairy product that some people may overlook, but its multiple benefits and functional properties can enable food manufacturers to continue to use all-natural dairy in their formulations without the drawbacks. It simply makes sense. 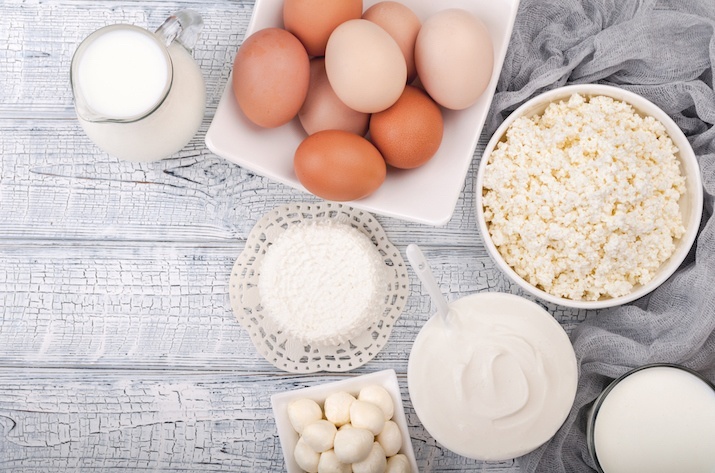 Take a look at any of your formulations that currently contain dairy ingredients such as milk, cheese, butter, cream (and even eggs) and you’ll likely discover several opportunities for reducing costs and improving quality using functional whey protein. Get that list together and reach out to the food scientists at Grande Custom Ingredients Group to talk through how to overcome even the toughest application challenges.